We focus on providing adult private parties provided by strong professional actors with a solid moral foundation. When the time has come to celebrate your religious, company or family events, we provide entertainment to bring people together in a morally positive environment. You need a group that can provide entertainment that can match the occasion and use aspects of the event in the content of the performance and understand the needs of people with a strong moral background. 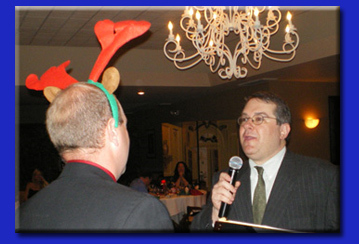 With a variety of game shows, improv comedy and murder mystery dinners available to fit most any need, it's no wonder that so many families and companies have appreciated the options we can bring to your special occasions. THEY improv is proud to provide company and family-friendly shows for Faith-Based and other gatherings. Entertainment that is wholesome and brings people together is great fun when in the hands of some top improvisational performers. Our 45-60 minute interactive family improv comedy show entertains with spontaneous creation of material on the spot. Audience members also participate in the show, either by simply providing suggestions or possibly being brought on stage. We adjust based on your desire and those in attendance. Because the show is improvised, each performance is unique and tailored to the audience. These shows are extremely flexible and can be brought into any venue that you like. We have performed in offices, parks, restaurants, hotel conference rooms, parking lots, homes, back yards, libraries, beaches or even on a roof! The shows are generally appropriate for any crowd but can also be adjusted to any of your particular needs. In addition to improvisational comedy shows, THEY improv also has a variety of game shows and murder mystery parties that will keep them entertained and having a great time as they work together.